In the opening round of the BCIAA boys basketball playoffs, No.2 seed Berks Catholic took on No.7 Daniel Boone in front of a packed house at Wilson. The Saints and Blazers had previously battled on January 15th, with the Saints coming out victorious behind a 53-46 score. However, from the opening tip Monday night, it was all Berks Catholic this time around. The Blazers doubled and sometimes even triple-teamed Saints center Nana Foulland. With so much attention focused on the man in the middle, the Saints were able to take advantage on the perimeter. Both Pop Lacey and Cooper Kutz were able to knock down open three point jumpers. At the end of one, the Saints held a 12-5 lead. The Saints defense, led by center Nana Foulland, limited the Boone offense to just 11 points in the first half. Cooper Kutz was able to shutout the Blazers leading scorer Kenny Worthington, who came in averaging 14.9 PPG. Despite putting multiple players on Foulland, the Blazers found themselves in serious foul trouble while trying to contain the county’s top scorer. Behind a big half from Pop Lacey, the Saints found themselves ahead 30-11 at the break. The Blazers foul trouble carried over into the second half as they found themselves in the double bonus with three minutes to go in the third quarter. On the receiving end of the majority of the fouls was Foulland, who went on to attempt 19 free throws in the game. The Blazers offense would awaken in the latter half of the quarter, cutting into the Saints big lead. With Blazers’ big men Mike Dabney, Cedric Mann, and Daniel Downs all fouled out, the Saints turned to Foulland on the offensive end and were able to keep pace with a suddenly hot Boone offense. When the final horn sounded, the Saints held on for a 56-40 victory. The Saints were led by Nana Foulland, who posted 18 points, 14 rebounds, and 9 blocked shots. Pop Lacey and Isaac Lutz each added 12 as well for the Saints. 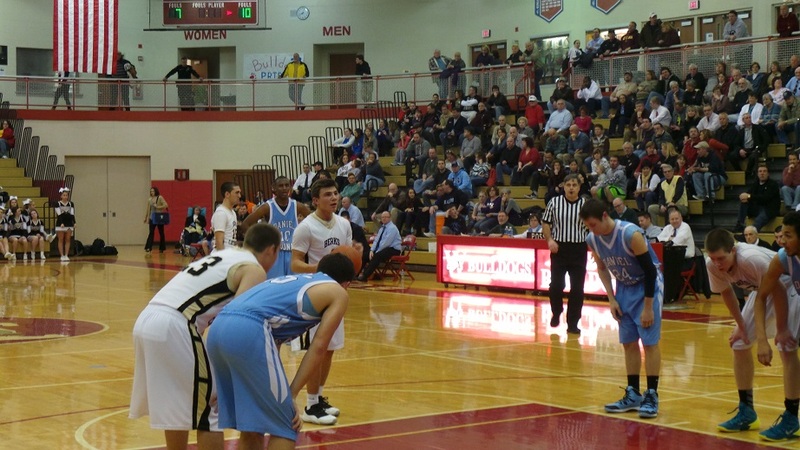 The Blazers were paced by senior Steven Sievers, who finished with 13 points. The Saints will next face Exeter in Wednesday’s BCIAA semifinals at Santander Arena.